I just ran a quick analysis on the performance of various STL containers on simple data insertion. The result was not exactly what I expected so I’d like to share it with you. What was performed was sequential insertions of 50,000,000 (50 million) unique pointer values into various STL containers, either by push_back or insert, depending on which method is supported by the container. I ran the test on openSUSE 11.2, with g++ 4.4.1, with the compiler options of -std=c++0x -Os -g. The -std=c++0x flag is necessary in order to use std::unordered_set. I was fully aware of the set containers being slower than list and vector on insertion, due to the internal structure of set being more elaborate than those of list or vector, and this test confirms my knowledge. However, I was not aware of such wide gap between list and vector. Also, the difference between unreserved and reserved vector was not as wide as I would have expected. (For the sake of completeness, a reserved vector is an instance of vector whose internal array size is pre-allocated in advance in order to avoid re-allocation.) My belief has always been that reserving vector in advance improves performance on data insertion, which it does, but I was expecting a wider gap between the two. So, the result I see here is a bit unexpected. 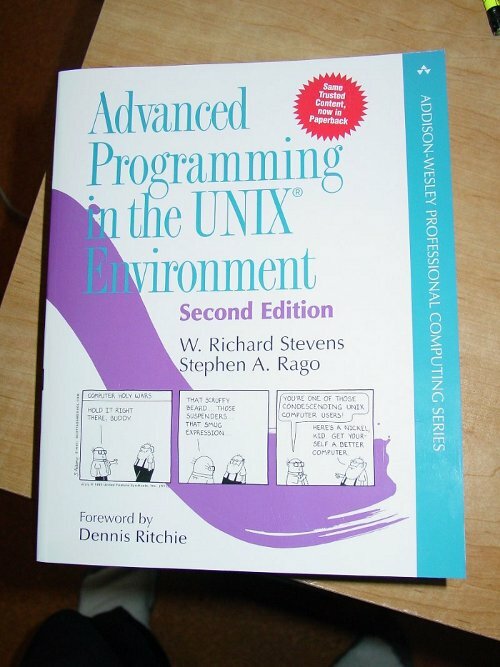 This is the 2nd edition of the classic Advanced Programming in the UNIX Environment book. I’m a happy owner of the 1st edition, and ever since the 2nd edition was published I had the urge to go ahead and order a copy. I had been fighting off that urge, but last week I had finally given up fighting and decided to place an order. The 1st edition truly opened up my eyes on the power of UNIX programming. Like the 1st edition, I am looking forward to discovering what this book offers, and how the UNIX system (most notably Linux) has evolved since the 1st edition was published.